*Price is total for 3 people and both price and availability are subject to change and are not guaranteed until completed through the booking process. When you arrive in Ireland you will pick up your rental car. After settling into your hotel, grab a bite to eat in the famed Temple Bar area of downtown (make sure to stop by during daylight hours, it gets a little crazy at night). Today is a day for connection with family, new and old. 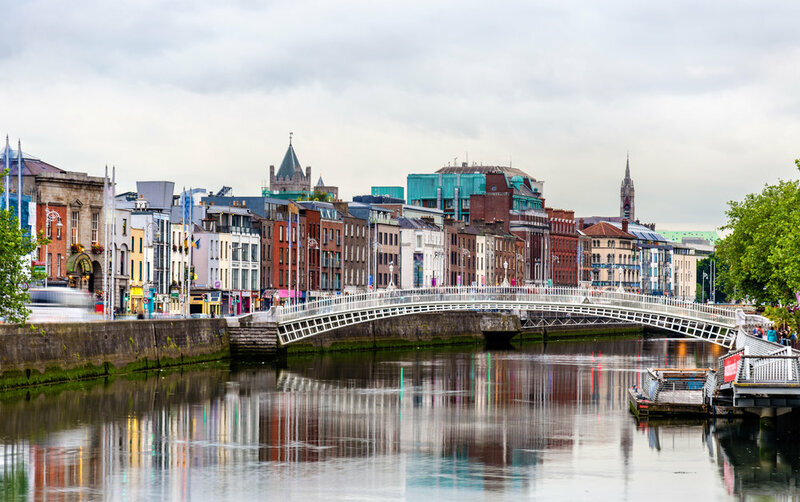 This morning, you'll check out of your Dublin hotel and hit the road! On the way to Cork, stop by the town of Kilkenny and the Rock of Cashel. Kilkenny is an awesome little city in Ireland. Explore the town in the morning, have lunch, and then continue your road trip, heading to the Rock of Cashel next. When you arrive in Cork, check into your hotel and hit the streets! Downtown Cork is a maze of bridges that span the River Lee and connect the marshlands and small island where the city center was built. It’s a city that’s best explored by foot, where sights like the towering St. Finnbarr’s Cathedral literally spring from the streets. When visiting what locals call “the real Irish capital,” ring the famous Shandon Bells in the church looking over the city, or go deep into an Irish prison in the dungeon-like Cork City Gaol. 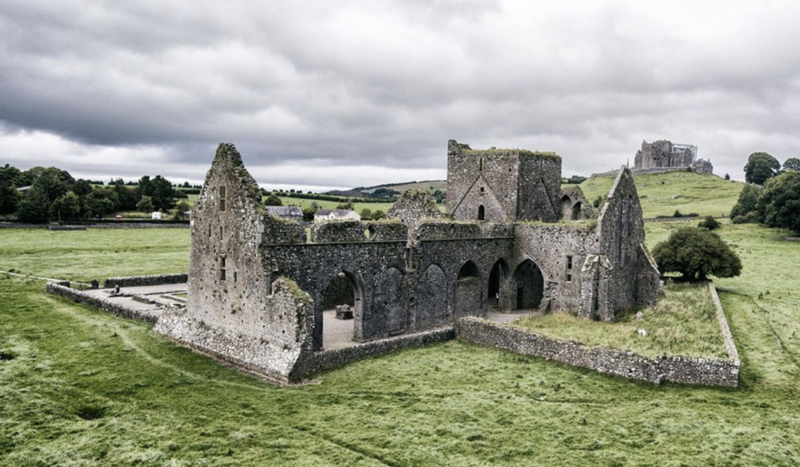 It’s also a city that’s often used as a base for visiting the Blarney Stone—the famous stone that’s believed to bring eloquence to anyone who gives it a kiss. This morning, you'll check out of your Cork hotel, and explore the surrounding area before heading to Killarney. Where the River Lee flows out of Cork and into the Atlantic Sea, Cobh sits wrapped in the protective arms of its Cork Harbor surroundings. This picturesque port town was known as Queenstown until the late 1920s, and of the 6 million Irish citizens who immigrated to North America, it’s believed nearly half of them waved goodbye to their homeland here on the shores of Cobh. Even more infamous is the tale of the Titanic, which departed on its doomed North Atlantic crossing from right here in Cobh. Tours today still detail the time the Titanic spent in Cobh—including the original wooden dock that the Titanic’s passengers walked on. Titanic Experience Cobh is located in the original White Star Line Ticket Office in the centre of Cobh, the departure point for the final 123 Passengers who boarded Titanic on the morning of April 11th 1912. The tour is presented in two parts, the first is an immersive audio visual tour retracing the footsteps of the 123 Passengers. With Fourth Officer Boxall as your virtual guide and with the use of innovative audio visual technology and replica set designs visitors will experience what life on board would have been like on board for those passengers. The second part of the tour examines how it went wrong. Using computer generated graphics to recreate the collision and subsequent sinking, film analysis of Titanic on the seabed and expert interviews these interactive exhibits allow visitors to find out how and why the Titanic sank on that fateful night. Touchscreen computers allow you to look at personalities on board the ship and in particular the fate of our 123 Queenstown passengers. Around lunchtime, travel to Kinsale, one of Ireland’s most picturesque towns. With colorful, winding lanes, fabulous restaurants, and a nearby golf course, Kinsale attracts a lot of visitors during the summer months. It’s also the starting point of the Wild Atlantic Way. Your roadtrip will take you on/off parts of the Wild Atlantic Way throughout your journey. Consider taking part of this roadway up the coast to your hotel in Kilarney, where you'll stay for 2 nights. The first amazing sight is of the Small Skelligs and its snow covered-like appearance, when seen from a distance. Upon sailing closer you realize it is 75,000 nesting gannets that cover the Island. Onwards to Skellig Michael to marvel the monks, who built the monastery on this remote island 600ft above sea level. 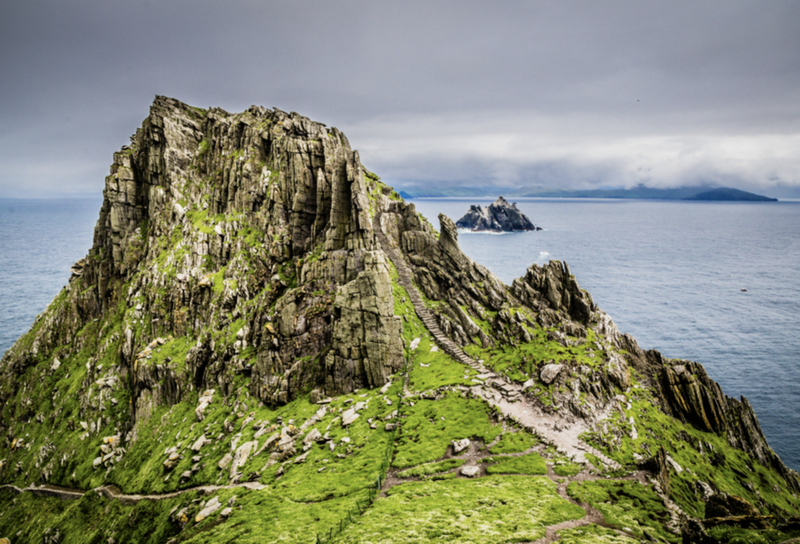 See locations where scenes from Episode VII and Episode VIII of the Star Wars franchise were shot. You will quickly see why this incredible location was such an attractive inclusion for the production team in the Star Wars universe. After you return to the mainland, set off to explore the Ring of Kerry. This morning, you'll check out of your hotel and set off for the Dingle Peninsula. After exploring the Dingle Peninsula to your liking, drive north to Dromoland, where you'll check into your hotel for the next 2 nights. Make your own way to Doolin Pier in time for a 10am departure. Set sail on the around 1-hour and 15-minute journey to Inis Oirr, the closest and smallest of the Aran Islands, and enjoy spectacular views of Galway Bay and the Cliffs of Moher as you cruise out across the Atlantic. From the moment you step aboard the gangway, you are treated to a feast of maritime activity, including dolphins following our wake! There is an air of anticipation as the ship sails ever closer to the island. Inis Oírr is just 30 minutes away, and reassuringly visible from Doolin pier. The voyage to the island pier passes some of its famous landmarks en route – the iconic Plassy shipwreck, O’Brien’s Castle and the Dun Formna stoneage fort on the hill, the white sandy beach with its crystal turquoise waters and possibly the most beautifully located graveyard in Ireland. Coming down the gangway is almost like stepping back in time, where it is easy to picture life in times gone by. On this island, you can (for example) visit an authentic cottage, where you can learn about the traditions, customs and clothing of the Aran Islands. Take a guided tour on a pony and trap, and enjoy the sensation of being transported at a leisurely pace along tiny roads, surrounded by an impossible vista of stone walls stretching in every direction. Rent a bicycle and explore the nooks and crannies in your own time. Let the children play in the fantastic adventure playground built on the sand. Feast on a lunch of the freshest seafood in one of the island's charming pubs. Choose to return at 2pm or 4:45pm, arriving back to Doolin pier with a treasure trove of memories of an unforgettable day. This will give you some time to go back to your hotel, change (drop off any souvenirs you may have purchased) and get ready for your late dinner banquet at Bunratty Castle. Arrive a little before the starting time of your banquet at Bunratty Castle in County Clare, so you won’t miss a thing. Check out of your hotel and take off on the road to Co. Clare. Before heading to the Cliffs of Moher, stop by Fitzpatrick's Pub in Doolin. The local seafood is particularly good here, and the cliffs can become especially crowded between 11am and 4pm. This will be a great way to dodge the masses, fill your bellies and see the village of Doolin. You may want to come back here again for dinner, as the village’s three historic pubs, Gus O’Connor’s, Mcdermott’s and Mcgann’s, all host nightly music sessions, where you can hear Gaelic poetry set to music and admire the soulful timbre of traditional instruments like Celtic harps, tin whistles, fiddles and Irish flutes. Musicians from all over the globe visit Doolin in search of the genre’s roots, and a number of events throughout the year bring together local and international musicians for impromptu jam sessions. After lunch, drive the short distance to the Cliffs of Moher. When you've finished watching the sun set from the Cliffs of Moher, drive north to your hotel in Galway. You'll stay 2 nights here. This morning you will head west along the southern shores of Connemara, looking out across beautiful Galway Bay. 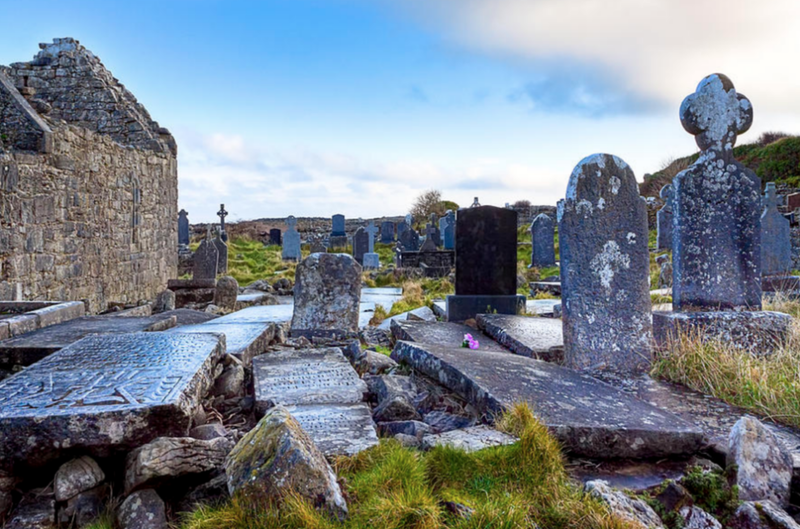 As you pass through the picturesque villages of Barna, Furbo, Spiddal and Inverin, you will see thatched cottages, dry stone walls, mountains, woodlands, rivers and streams, lakes, Connemara ponies, amazing beaches and unspoilt bogs and deserted islands. Your first scheduled stop of the day could be Pearse’s Cottage. Patrick Pearse was one of the leaders of Irish Nationalism and a signatory to the Irish Proclamation of Irish Independence, read out by him outside the GPO in Dublin during the Easter Rising 1916. Then it’s on through Connemara’s hidden jewel, Bothar na Scragoige. View the wilderness bog landscape and experience the tranquility and isolation of Connemara. Stop by your castle hotel, Ballynahinch Castle, to check into your accommodations for the next two nights. Then, after you've put your things down, head back out on the road to explore the rest of the Connemara! Head out along the Wild Atlantic Way. To your left will open up the iconic Dog’s Bay Beach stretching a mile out into the Atlantic. Next is Derrygimlagh Bog (Wild Atlantic Way – Signature Point). This remote site was the centre of the communications (Marconi) and aviation world (Alcok & Brown) in the beginning of the 20th century. After travelling through Clifden, the capital of Connemara, you head skyward. Renowned worldwide for its heart stopping twists and turns, the Sky Road (Wild Atlantic Way – Discovery Point) swoops and soars above the Atlantic Ocean. The views and photo opportunities from this ‘Discovery Point’ have to be seen to be believed. Next stop to explore and hike in the Connemara National Park. You'll check out of your hotel this morning and travel to Ashford Castle! Ireland’s School of Falconry is the oldest established falconry school in Ireland. During your one hour private Hawk Walk, YOU fly their Harris hawks. Your instructor will introduce you to your hawk and, within minutes, you will be setting off around the magnificent woodlands to fly your hawk free. As you fly the hawks, your instructor will explain about the hawks’ exceptional eyesight, their speed and agility and how the hawks were trained. The hawks will follow you from tree to tree through the woods before swooping down to land on your gloved fist. This is truly a one of a kind, lifelong memory. Once you have finished exploring Ashford Castle, continue on your day by driving north to Northern Ireland. You'll be leaving the country of Ireland and entering Northern Ireland. The border is almost non-existent (you'll know you are in Northern Ireland when the yellow broken line on the left side of the road - changes to a solid white line. ... and when the speed limit signs change from KM/Hr to MPH). Still, have your passports ready! You'll check into your Northern Ireland hotel for just one night. After checking out of your hotel this morning, begin exploring the area with a stop by Dunluce Castle. Today, the mainland courtyard of the castle leads downhill to a narrow crossing where you’ll find buildings dating back to the 16th and 17th centuries. Dunluce Castle is thought to have been the inspiration for Cair Paravel in C.S. Lewis’ Chronicles of Narnia and has been the site of movies such as Jackie Chan’s The Medallion. Just a few minutes down the road is the UNESCO World Heritage site, The Giant's Causeway. The Giant's Causeway is a cluster of approximately 40,000 basalt columns, around 50,000,000 years old rising out of the sea on the Antrim Coast of Northern Ireland. The area draws thousands of tourists each year who come to marvel at and photograph this natural wonder. These rock formations get their name from an old legend stating that Irish warrior Finn McCool built the path across the sea to face his Scottish rival, Benandonner. There are several variations of the story from this point, but each one ends with Finn dressing as a baby and scaring off Benandonner, who thinks the disguised Finn is actually the child of a giant and is too afraid to face his opponent. On his way back to Scotland, Benandonner tears up the path behind him, leaving just what exists today on the Northern Irish coast and the Scottish island of Staffa, which has similar rock formations. While the legend surrounding Giant’s Causeway makes for an interesting story, geologists have a different explanation for the creation of the Giant's Causeway: volcanic activity. It’s said that millions of years ago, a volcanic eruption produced a lava flow that cooled quickly from both the top and sides, shaping the lava into hexagonal columns. Over time, the elements have continued to sculpt these columns into various shapes, and some are known to resemble objects. Notable formations include the Chimney Stacks, Giant's Harp, and Honeycomb, all of which are favorites of visiting photographers. Spot these formations and other stunning views framed by the windswept cliffs on your walk over the columns to the edge of the sea. Then, the brave-at-heart have the opportunity to cross the Carrick-a-Rede Rope Bridge. Carrick-a-Rede is an abandoned fishing island located just a few miles from the Giant’s Causeway. This 65-foot-long bridge is built from rope, and the views from it are arguably some of the best in Ireland. The current bridge is less than 10 years old and is made of wire and Douglas fir. There is no record of anyone falling off the bridge, but it is not uncommon for visitors to get cold feet after crossing once, requiring a boat to bring them back to the mainland. Your last sight of the day will take you to Dark Hedges. Off the Antrim Coastal Road, you will find one of the most unique and most photographed attractions in Northern Ireland: a row of trees known as the Dark Hedges. Planted by the Stuart family back in the 18th century, these beech trees are now overgrown and intertwined, creating a tunnel along the stretch of Bregagh Road that once led to Gracehill, the Stuart family manor. Legend has it that the trees are haunted by a mysterious gray lady who weaves in and out of the trees at dusk. In addition to being a popular subject to artists, the trees also serve as a frequent backdrop for wedding photographs and have been use for scenes in the show Game of Thrones, representing the Kings Road. When you're done seeing these remarkable sites, drive back south to Dublin. 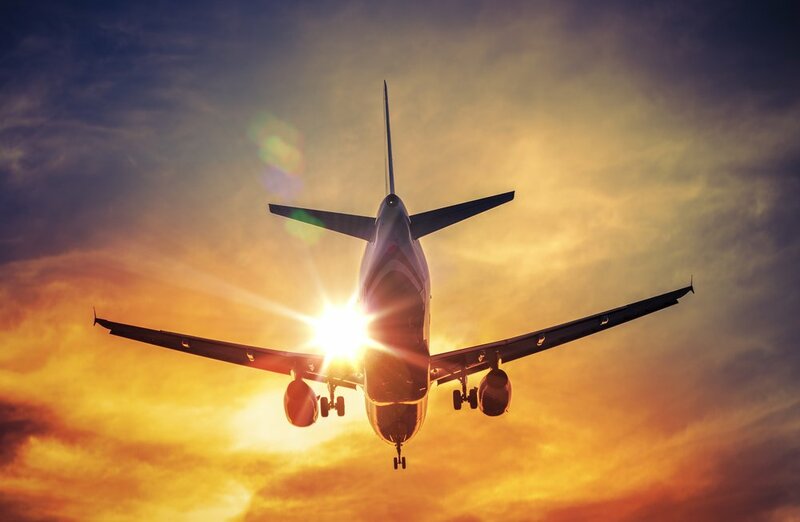 You'll stay the night near the airport for your morning flight, tomorrow. Today you will bid farewell to Ireland. You'll return your rental car at the DUB airport and board your flight home. We recommend you bring one medium-sized suitcase (smaller is fine!) and a day bag (example: small back pack or purse). A medium-sized suitcase is about 28 in. (height) x 17 in. (width). You can keep the day bag with you on the mini-coach (there's a nice overhead area above your seat) and your other suitcase will go in the back of the mini-coach which you can access during the day if needed. You will need to carry your bags from your car into the hotel and possibly up steps. Many local guest houses do not have elevators. In Northern Ireland, you will need British Pound Sterling. ATMs are readily available in Northern Ireland. ATMs are available in the Dublin airport and all across Ireland. Check the back of your debit/ATM card to verify it is a Cirrus or PLUS account. If you don't see Cirrus or PLUS and the debit card is a MasterCard or Visa, look for an ATM with your card's logo (MasterCard or Visa) and your debit card should work there. For credit and debit cards, Visa and MasterCard are commonly accepted. ** For U.S. credit cards when doing a transaction in Ireland, you may be asked if you'd like the amount processed in US dollars or the local currency, Euros (Republic of Ireland) or Pound Sterling (Northern Ireland). We recommend choosing the local currency so you will get the best exchange rate. If you choose US dollars, typically a 3.5% additional fee is added to your total. Should I take money (Euros or Pound Sterling) to Ireland with me? American credit cards typically have "Chip and Signature" technology. Your credit card can be inserted into the slot for chip cards and a receipt will print out for you to sign. Most of the accommodations have hair dryers but the Irish don't usually keep them in the bathroom. *payment schedule does not include insurance costs. Insurance is due within 10 days first payment. Insurance costs are based on the total tour cost, including air taxes and charges listed under "Included."